I was just comparing the old and new 3840x1200 renders. The new one looks great, and I really like how the moon is offset so it is no longer split across both screens. Use the original quite a bit, this is over the top awesome. Nice new render. Making it slightly brighter and changing the bluish to orangeish (which I agree makes it feel warmer) is a definite improvement. Love the new version. Like the clarity and warmer feel to this one. Still a fan of the original, too. This new render of Moonlit Oasis has kept the darkness that was in the first version, but at the same time made it very inviting and warm. I absolutely love it, good job Ryan! Ryan, great job. The image really pulls the viewer in. Could you do one more? Maybe something halfway between the new version and the old re: sky color? The original blue was nice, too, but lacked the clarity of the new version. Unfortunately, the original was also just a little monochromatic. Maybe it's the weather keeping me down, (23 degrees F). The warmth portrayed in the new version (and it really "looks" warm) seems foreign at the moment. I like the new render Ryan, I know you get people saying about how a lot of your work is often dark and blue but I like it. Keep up the good work. Last week I added a set of free images sized for use as "cover images" in the new Facebook "Timeline" profile layout. I was going through some of my older work and came across "Moonlit Oasis" from 2009. It was a bit controversial when I posted it because quite a few of my Members said it was too dark. I stuck to my guns at the time, but now I could really see their point. I opened up the scene file (in Vue 10 this time) and tweaked the lighting and atmosphere just a bit and re-rendered the scene. I will let you be the judge as to whether or not it is better than the original. Thank you for creating this lush beauty! @Members complaining about the brightness, this is a ridiculously simple fix with any photo editor. Who doesn't love a "Nights of Arabia" theme? C'mon people, this image is straight ill. Simple, effective and brilliant. The moon as the centre piece works very well with the silhouettes of the foreground... nice touch with the glimmering water at the bottom!! Lovin the landscapes you produce! Nice one Ryan! In the middle section of the picture you can see a reflection on the water, and clouds in the sky. On the edges the silhouettes become unclear and faded with the night, but I'd like a little more backlighting from the moon to give the silhouettes some more detail. As is, the moon's light is a little overpowering in the middle compared to the edges. Oh, my apologies! I only looked at the preview image on the Free Gallery, where the watermark looks huge in comparison to the size of the image. I didn't realize the watermark in the actual wallpapers is quite unobtrusive. Ryan, your new watermark looks pretty good. I agree with @cmmnoble, it is a great way to identify your work. The watermark is how i found your site in the first place, i googled wallpapers, found some awesome walpaper you had done and saw the DB watermark on it and BAM I now have a lifetime membership. I don't see it as intrusive and i completely disagree with @Kevin about it being like the one on the link he posted, yours is more like a signature that i have seen on a painting, rather than a watermark that blocks the center of the image to make it unusable. Keep up the great work. I tried this a number of different ways before settling on this design. The trees were set up to frame the dunes and that purpose is defeated by not having the moon front and center. Really. All I see is the moon. I get what you're trying to do. I really, and honestly, do. But...that moon. As my brother says, "it makes my eyes' bleed". Maybe the image, and the majesty of the piece, would've been better served by putting the moon behind the camera's eye/lens? That way, we'd still have the lighting we want, but without that overwhelming light staring at us in the eye. I really like this image. I realize I have a special place for the blue, darker images and that it was "Orthohedron" and "Cobalt Daisy" that drew me to Digital Blasphemy in the first place. More recently, its been "Tropical Moon (2007)," "Harbinger," etc. that have appealed to that same "love of the night"
Since it's October, do you have a halloween project in the works for this year? I was reading some of the other comments. I agree with Tim. I do like the dark backgrounds more because the busy or brighter ones make it hard to spot the icons on the desktop if I have a lot of stuff there. Also, I don't know why people might complain about the watermark. Honestly, I never notice them. On my computer, the task bar at the bottom of the screen covers most of it anyway. Even it it didn't, it still wouldn't bother me. The watermark is small and unobtrusive and anyway I'd never expect that an artist wouldn't want to sign their work. Think this possibly my favorite so far keep up the good work!! Hello. I just wanted to say that I like the watermark. A Digital Blasphemy image just wouldn't be a DB image without it. And I like the new version of the watermark better than the old one. The new watermark is smoother and slightly more transparent and seems to blend with the images more slickly than the old version. Please don't change your watermark, Ryan. Personally, I think the lighting is perfect. For me, a simpler desktop is better. I hate losing icons in a busy background image. The dark foreground, contrasted with the bright moon, allows for an outstanding range of blue/purple shading. As for the watermark, I guess I'm not sure what all the complaining is about. It's tiny, and in the corner. If some want it gone so bad, there's nothing stopping them from blanking that spot out with an editor. I agree with @JK: use an artistic watermark (your signature), not an obtrusive piece of text. Besides the watermark issue, the images are great. outstanding work as usual! however, like some of the other comments, to me it seems a little too dark. 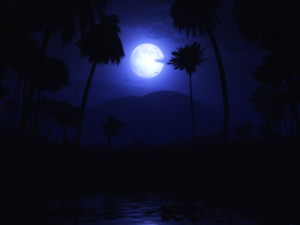 Perhaps a moonlit oasis where the Moon is behind the image illuminating the oasis? It would brighten it up while still keeping that night perspective. Ryan, use a fine sharpie and *hand write* an image that says Ryan Bliss, Digitalblasphemy (or whatever). Scan it. Tinker in Photoshop making background transparent and save as PNG. Resize as needed and use it as your watermark. The idea being the type wouldnt be as bold and it will still have some artistic flair. People wouldn't mind it as much as bold fonts that look machine made. Think of it as your digital signature, not a watermark. First, let me start by saying I love Ryan's recent work. Turning around a moonlit version of Oasis was a brilliant and unexpected move. Thanks for the extra effort! Since the conversation has decayed into discussing the watermark, I'd like to chime in as well. While I understand the argument that paying customers feel a right to have a "product" delivered how they see fit (watermark and all), art is exempt from this rule; you are buying what the artist has created, not something tailored to your specific needs. Besides, wouldn't it be silly to buy a painting, and then ask the painter to move his signature because it's ugly, or blocks a part of the painting, or [next complaint here]...? I'm not shooting down anyone's opinions, and it's wonderful that Ryan provides us a forum to discuss. Just offering my own two cents worth. While I still enjoy your archives, I have been unable to utilize your past year's worth of work due to chronic darkness. On both my work (lcd) and home (crt) monitors the pictures are too dark to use. I can't remember the exact piece, but you once made mention of some detail work in an area that shows up on my screen(s) as a jet black blob. Tweaking the monitor settings doesn't work, it's not even close. Maybe I'm the only one, just thought you ought to know. In my opinion, they became far too apparent and obstructive from the moment the new ones were introduced. Too bulky, too grey, too obvious. It's just a real shame to wreck such beautiful artwork with a watermark that sticks out like a sore thumb. I understand DB is one of your main revenue streams, but forcing watermarks on paying customers is a bit of a joke to be honest. If people approach me and ask where I got my wallpaper from, hey I'd be more than happy to tell them about DB, but the new watermark is blatant advertising and in some cases such as here ruins the image. Other wallpaper sites offer ALL of their wallpapers out for free in standard quality with watermarks. Their paid users get access to the HD version and no watermarks. Now I'm not saying you should offer all wallpapers out for free, but please consider removing the watermarks for members in the future. Or...please offer an extended membership plan to have no watermarks. Or hey even just go back to the old watermarks. I like the symmetry but the moon gets split between monitors in the dual screen versions. Perhaps having the moon pushed a bit to one side (behind one of the palms) would look good in all resolutions? I tend not to notice/ignore them I guess. didn't notice how bright it is but it still doesn't bother me. It's way down in the bottom corner. Perhaps the watermark is more noticeable on this image because of the dark background? I just thought I would add a screenshot for you Ryan. Unfortunately the watermark on this one is the only reason I wont use it as my background, even though the picture is fantastic. I hope you can see what I mean about it standing out too much. Ben, I have no issues at all with the watermarks. Like I said, I like others to know where my fantastic wallpaper came from. All I am saying is that the new ones are a bit of an eyesore; like Christian pointed out. Ryan: I've never thought the watermarks an eyesore - and I've been around since 2000-2001. From 1024x768 up to my current 1680x1050, they've never seemed intrusive to me. As for the folks who want to buy an extra tier without one, I think that would open up an unnecessary element (these things do end up on other sites, I often flag them down when I see them being touted as "original"). The watermark should be what you choose, and people need to learn to live with it. DB's aren't as intrusive as some other ones I've seen. Paid or not. The watermarks in still in flux. Can I ask what resolution you use Christian? Couldn't agree more with the user who spoke about the water marks. New ones are an eye-sore and are far too obvious. At least the older ones were subtle, yet clear enough to promote the site. Perhaps you could offer an extended membership plan that lets us download wallpapers with no watermark for an extra price? Beautiful, but I also agree its too dark! even tho I don't need to turn up brightness, I still think it can do with some fireflies to make it a little more lively! Otherwise I quite like it! I only hope you put this out for dual-screens, it is a fabulous moody enhancement of the originally very wonderful image. I definitely love it! Just as good as the daylight, maybe even better! I love nighttime wallpapers the most! Too dark Ryan, but I love the moon! I love it. Definitely a nice twist on the original. I think a lot of the people need to turn up the brightness on their monitors, because I have no trouble at all making out even the smallest details on each and every tree. Yeah, way too dark for me as well. Still a pretty pic, but all the beautiful detail is completely lost. I agree with John A, needs some reflected light against the trees. Can't you make it more about silhouettes? The only parts you can really see the foreground shapes in are the areas immediately around the moon. Really all I can see in the small image above this comment window is the moon and two tree shapes. I can't even see where the sides of the image are next to the black background of the webpage. When I saw this I instantly had a peaceful feeling wash over me. This is a very pretty picture. I just love the calming affect that it gives. Great job, I look forward to your next render. Ryan said, "For that reason I think I would rather people turn the brightness up than have to turn it down." I think Ryan has a point here, since many comments in the past have noted certain renders as too bright, as well as too dark. Darkness and brightness is subjective, and it also depends upon screen resolution and settings. It's easy to lighten a scene even if you don't have Photoshop. Picasa 3 (free from Google - http://picasa.google.com/) does a decent job, and so do other free programs. Usually I don't have issues with the night scenes, but this one seems too dark on my computer too. Way too dark I think. This one is great, I like it much better than the day version. Fantastic night scenes. One thing that I noticed about your most recent wallpapers is that the watermark has been re-done and is now more glossy. I don't know about anyone else but I liked the old standard text watermark better, the new one stands out too much and looks a bit cheesy. I really sincerely hope you think about reverting back to the old watermark. love Ryan's night sceneries works! Your night scenes are by far your best work, and this is no exception. Wasn't a huge fan of the day version, although this one looks absolutely brilliant. :D - Reminds me of Harbinger (2009). Just one thing you might be interested in: The watermark on 1440x900 sits a little high up compared to other resolutions. I tried it out next to my 1280x1024 which confirmed my suspicions. Just looks like it could do with a few nudges down. once again good work, I really think that a night version is a good idea, but you would do the wallpaper a favor by turning the light up a bit. I am affraid that to many ditails are lost, when it is this dark. i know, you ment for it to be this way, but i would really like to see it in a brighter version. I almost prefer this night one over the day...then again I always loved your night scenes Ryan! I'm a sucker for dark wallpapers especially night scenery. Well done! You're killing me with all these variations - I love it! I saw this one and my jaw dropped. It looks fantastic. I don't even think it's too dark. I love the mood of this image. I have no criticism to offer and no suggestions. This one's a ten. I'm not in love with it, the silhoutes that is, but I don't particularly mind it. I would like there to be a bit more light, to see some of the spectacular detail that is in the day version... it almost feels like that's missing, but it's probably because the day version simply eclipses this version. Love this one! I REALLY like that you can't make out all the detail...makes it a little mysterious. I love your night / BLUE images! This just took the coveted spot as my desktop background! BRAVO! I love this. I see a DB classic in the making. I agree that it's too dark. I realize Ryan wanted all silhouettes, but there should be some natural light transmission from the water to the plants in such a scene - which would help differentiate the individual silhouettes and provide greater depth to the image. Speechlessly beautiful, haunting. Top work! RYAN! RYAN! HE'S OUR MAN! Okay...(putting away pom poms), wow, ANOTHER render and so quickly! I love your night scenes. This is great -- thank you so much for adding a night render to Oasis 2009. Maybe it's a tiny bit too dark as others have said, but personally I think that just gives the scene a feeling of mystery. The moon and clouds are wonderful. Great, Ryan, thank you! IMHO it is too dark. Thanks for the feedback. The darkness is, of course, intentional. I realy wanted this one to be all silhouettes. For that reason I think I would rather people turn the brightness up than have to turn it down. I do like your night versions of your images. They are not as bright as the day ones but you can still make out most of the detail. This one very dark and can barely make anything out. It's still a great image. Some of my favorite images are the night scenes, like firstmoonlight, and especially reverie and summerwood, but I think this one is a bit too dark. This is probably not helped by my monitor being a bit darker than usual, but the goggles do nothing. :/ I opened the image in Gimp and changed the brightness to 80 and the contrast to 60 and I'm able to make out more of the surroundings now. Ryan, Great job! The subtleties draw the eyes around the scene, making it very interesting. Fine work! This render is absolutely gorgeous! I believe this one is gonna go on all my computers and my cell phone. Always love it when you follow up with the opposite day/night version of the original. It's always interesting to see how different it looks. Love it love it love it. Again, can't wait for the multi-monitor render! Bravo. Awesome job! I always love it when you do night versions of your works. I generally prefer darker backgrounds, so this is perfect. Keep up the good work. Yes, yes I am and it's cool! Love this... immediately going on the desktop. I love it. I love the dark, so black around the edges there's no detail. Makes the moon and the water stand out even more. This baby is going on my desktop today! This is perfect. I love simple dark backgrounds that don't make it hard to find icons. This will instantly be used as soon as the dual screen version is done. BUT... it is too dark! I think it could be a bit brighter around the oasis. Thanks for another wonderful picture. Very nice, I like this one better than the original! Reminds me of Harbinger, same cool blue look!